An Indian court has sentenced a former politician to life in prison for inciting anti-Sikh violence in riots after the 1984 assassination of Prime Minister Indira Gandhi which claimed thousands of lives. Sajjan Kumar was a key leader of Gandhi’s then-ruling Congress Party when she was gunned down by two of her Sikh bodyguards. They killed her four months after she ordered Indian troops to storm the Golden Temple — one of Sikhism’s holiest shrines — to flush out separatists. Thousands of Sikhs across the country were killed by mobs in the days after Gandhi’s assassination, including 2,733 in Delhi alone, the High Court of Delhi said Monday in its ruling overturning a lower court’s 2013 acquittal of Kumar. Kumar previously served as a leader of Congress, which ruled the country for most of the post-independence era but is now the main opposition. His conviction relates to the killing of five Sikhs in West Delhi in the days after Gandhi’s assassination. The court relied heavily on three eyewitnesses — including Jagdish Kaur, who was the wife of one victim, the mother of another and cousin of the remaining three. Nipreet Kaur, another witness, saw her father burnt alive by a raging mob, the High Court said. 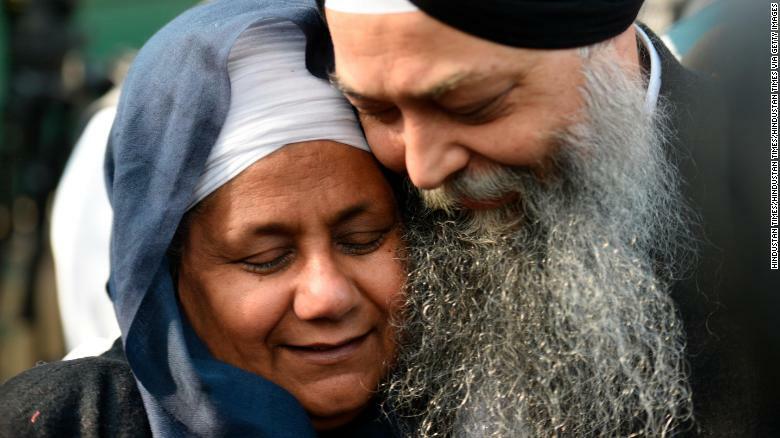 Nirpreet Kaur, an eyewitness to the 1984 Sikh massacre, is seen with AAP leader Jarnail Singh outside the Delhi High Court after Kumar was sentenced to life imprisonment Monday. “While it is undeniable that it has taken over three decades to bring the accused in this case to justice, and that our criminal justice system stands severely tested in that process, it is essential, in a democracy governed by the rule of law, to be able to call out those responsible for such mass crimes,” the verdict read. Kumar was ordered to surrender himself by December 31.